In response to the recent influx of refugees in Surrey, the Kwantlen Public Interest Research Group hosted a free seminar event for KPU students and staff on July 26. The event, “Refuge in Surrey: Stereotypes, Survival and Sanctuary”, aimed to teach people about refugees and the challenges they go through every day, as well as how to refrain from dangerous stereotyping. KPIRG began planning the event last March, after receiving a grant from the City of Surrey. It was facilitated by three presenters from DIVERSEcity Community Resources Society, a non-for-profit agency that offers a variety of programs and services to culturally diverse communities throughout the Lower Mainland. During the seminar, KPIRG Director of Anti-Oppression Zafreen Jaffer said that using KPU as the setting for the event was deliberate, as many students at KPU either have refugees in their family or are refugees themselves. Surrey is the fastest-growing city in B.C. and is expected to eventually become the largest in the province. Wafan Zaqout, one of the DIVERSEcity presenters, explained that “57 per cent of all Syrian refugees living in B.C. reside in Surrey. The other 43 per cent makes up the rest of the province,” according to statistics from 2016. Each presenter was classified as a refugee when they first arrived in Canada. At “Refuge in Surrey” they spoke about a mix of facts and true stories from both their clients and their own personal experiences, highlighting the struggles that refugees face. “Refugees are strong, resilient people,” one of the other presenters, Herman Lay, said. The presentation itself was broken into three main components: explaining the exact definitions and processes involved with getting refugee status in Canada, what a person could be personally dealing with as a refugee, and obstacles such as social isolation, education, language, or work barriers, and physical or mental health. 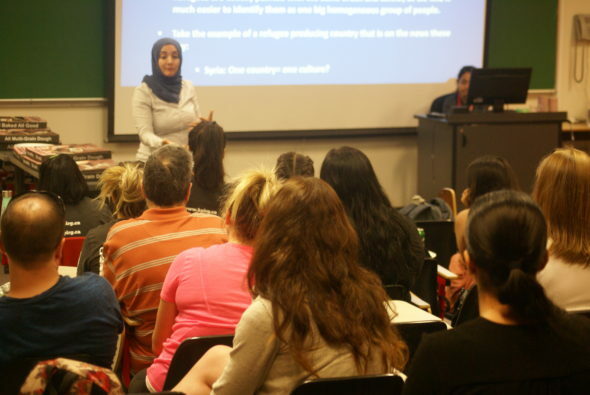 The conclusion of the presentation examined how refugees are seen and treated, and also critiqued societal prejudices. The presenters explained that knowing how to provide the support that refugees need when they are adjusting to living in their new home is key to preventing dangerous stereotyping. “Even though different groups coming from different places deal with different issues, the struggles do overlap and there are a lot of similarities, but there are a lot of differences too, so you can’t put them all together and say this is the solution,” said Jaffer. Bruce Ferguson, a philosophy student at KPU and an Algonquin member of the Kitigan-Zibi Anishinabeg community in Maniwaki, Quebec, came to the presentation in hopes of starting a conversation that includes not only refugees and Surrey citizens, but First Nations across the country as well. KPIRG will be planning similar events in the next few months to continue building on these narratives, but the dates have not been finalized yet. According to Jaffer, there will be an event about mental health, disability, and Aboriginal communities in the fall that will also be sponsored by the City of Surrey. Jaffer hopes that the people who attended Refuge in Surrey took what they learned and put it in perspective with their own lives.